The Conservatives could be at risk of losing their overall majority, while remaining the largest party in Westminster, the exit poll suggests. 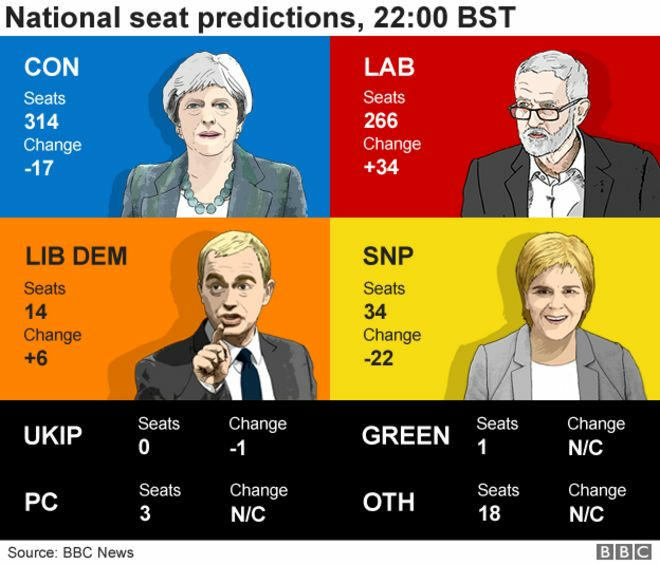 The Conservatives are predicted to win 314 seats, Labour 266, the SNP 34 and the Lib Dems 14. The parties require 326 seats to command a majority. If the exit poll is correct, Prime Minister Theresa May's hope of securing a substantially larger majority has not been fulfilled. The poll also suggests a decline in SNP support in Scotland. The results of the NOP/Ipsos MORI poll for the BBC, ITV News and Sky News were released after voting ended at 22:00 BST. Based on analysis of the exit poll by professor of politics John Curtice and his team, here are the seat-by-seat predicted results. As real votes are counted, these forecasts will be updated. The seats listed below are those where the main parties are likely to make gains or where the result is too close to call. All parties could make gains in those seats currently being described as too close to call. We are forecasting 11 Conservative gains. Six of those are in Scotland, four in Wales and one in East England. We are forecasting 14 Labour gains. Five of those are in North-West England, three in London and one each in Scotland, East England, the East Midlands, the West Midlands, South-East England, Yorkshire and the Humber. We are forecasting four Lib Dem gains. All of these are in Scotland. The race in a large number of seats is so tight that the result is currently too close to call. There are 76 seats that our predictions show as being too close to call. 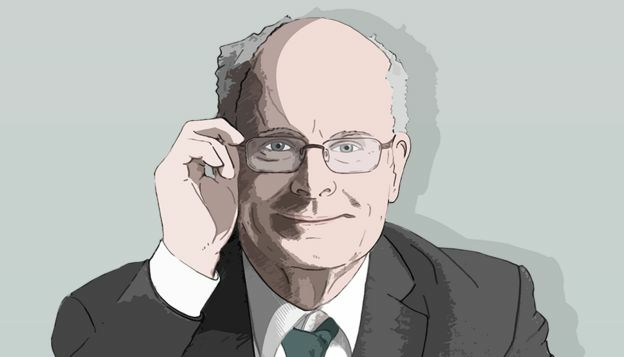 Analysis for this page is carried out by professor of politics John Curtice, of Strathclyde University, and his team. The BBC/ITV/Sky exit poll is conducted by asking a random sample of voters at one of 144 polling locations scattered around the country to complete in private a mock ballot paper to indicate how they just voted. Nearly all the locations are ones in which the 2015 exit poll was also conducted. The share of the vote recorded for each party at each polling location this time around is compared with the share obtained in the 2015 exit poll in order to derive 144 estimates of change in support for each party. These estimated changes in vote share are then statistically modelled to (i) ascertain any systematic geographical variation in the estimated changes in vote shares, and (ii) derive estimated vote shares for every party in every constituency in Great Britain. From the latter, the probability as to which party will win each seat is derived. For each party the exit poll forecast of seats won is the sum of these probabilities of winning across all constituencies. Once declarations begin, forecasts are then based on a combination of exit poll and real results.